The Russian Defense Ministry completed state tests of the shipborne anti-aircraft missile system (ZRK) of the Polymer-Redut 3K96-2 vertical launch. This was announced by the Commander-in-Chief of the Russian Navy, Admiral Vladimir Korolev. The new air defense system is designed to protect destroyers, frigates and corvettes from a wide range of means of air attack. The capabilities of the complex allow to intercept targets at a distance of up to 150 km. However, in the coming years, Polyment-Redut should receive a rocket capable of destroying objects at a distance of up to 400 km. Commander-in-Chief of the Russian Navy, Admiral Vladimir Korolev, speaking before the Assembly of the St. Petersburg Maritime Assembly, announced the completion of state tests of the anti-aircraft missile system (ZRK) of the 3K96-2 Polimet-Redut vertical launch. This was reported by the newspaper "Red Star". According to the press service of the Northern Fleet, in October 2018, the lead frigate of the project 22350 “Admiral of the Fleet of the Soviet Union Gorshkov” made several interceptions of aerial targets using the “Poliment-Redut” air defense system. All high-speed and low-flying air targets were successfully hit. In November last year, Defense Minister Sergei Shoigu spoke about the conduct of more than ten launches from the newest missile system. 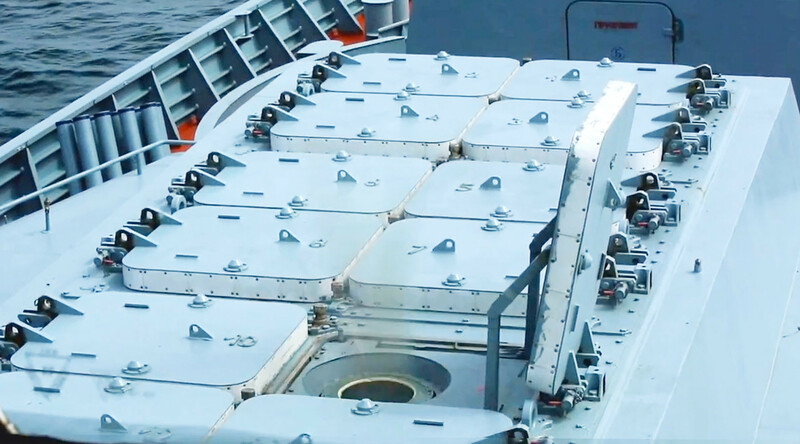 "Polyment-Redoubt" is designed to protect destroyers, frigates and corvettes of the Navy from air attack. The complex is capable of hitting aviation, cruise and anti-ship missiles of the enemy at a distance of up to 150 km. In the coming years, the arsenal of this air defense missile system will be replenished with an ultra-long-range anti-aircraft guided missile (SAM), which is being created on the basis of the 40N6 munitions of the S-400 and S-500 ground systems. The new ammunition will allow Polimet-Redut to intercept the target at a distance of up to 400 km. The development of the “Poliment-Redut” air defense missile system was launched on a proactive basis in the mid-1990s within the walls of the Almaz-Antey concern. The designers decided to unify the promising naval air defense system with the mobile air defense system of the medium-radius S-350 Vityaz, which was designed to replace the earlier versions of the S-300. In an interview with RT, the founder of the Military Russia portal, Dmitry Kornev, noted that the unification of ground and sea air defense complexes gives tangible advantages to the defense-industrial complex (DIC) and the army as a whole. This approach allows you to save significant funds on the organization of mass production, as well as improve the performance characteristics of the air defense system. “Unification is a global trend. It involves the production of the same type of elements of structures, assemblies, units, systems, launchers and ammunition, which are equipped with various weapons systems. Of course, marine and land analogues have a number of differences related to operating conditions. However, if everything is thought out correctly, unification significantly reduces the cost and simplifies the process of mass production, ”explained Kornev. For firing, the Polimen-Redut anti-aircraft missiles use launchers (launchers) of the universal ship complex 3S14 (UCSC), which are equipped in the Russian fleet with ships carrying the Caliber cruise missiles and Onyx anti-ship missiles. Specialists "Almaz-Antey", designing a new ammunition, implemented in it the principle of "fired and forgotten." Its essence lies in the fact that the missile is equipped with an active homing head (GOS). It allows the anti-aircraft missile in the final leg of the flight to hit a target without receiving data from a radar station (radar). Currently, the Polymen-Redut air defense missile launcher consists of three types of vertical launch 9M100 (range up to 15 km), 9M96 (up to 120 km) and 9M96D (up to 150 km), capable of speeds up to 2100 m / s. The promising missile index, which will be able to intercept at a distance of up to 400 km, is not disclosed by the RF Ministry of Defense and Almaz-Antey. Installing a vertical launch for the use of the system "Poliment-Redut"
“The key role in the arsenal of the Polyment-Redut complex is played by the 9M96 family of missiles. These missiles are characterized by high maneuverability, accuracy and relatively small dimensions. Their energy reserves must ensure the defeat of the Tomahawks, AGM-158C LRASM anti-ship missiles, airplanes and all types of targets moving at speeds close to hypersonic, ”stressed Kornev. In addition, the advantage of the "Polyment-Redut" complex is high fire performance. He is capable of firing multiple targets simultaneously. The probability of interception of each, according to Kornev, can reach 80%. The ammunition of the “Polyment-Redut” air defense missile system is 32 missiles. The development of the carrier ship and the test phase were delayed due to the difficulties associated with the creation of a full-range radar with a phased array and the 9M96 missile defense system. The first launches took place in 2012 and were unsuccessful. However, in 2014–2015, the Corvette “Savvy” of Project 20380 conducted a series of successful interceptions in the Baltic Sea. According to the Ministry of Defense of the Russian Federation, the Zour launches took place "in the conditions of difficult jamming conditions with the use of electronic countermeasures on both sides." As suggested by Kornev, the Russian specialists had difficulties in fine-tuning the radar station and the 9M96 offshore version of the rocket. According to him, the main problem was the lack of "a bundle between the radar, the firing complex and the missile." During unsuccessful tests at the launch site of the flight, the radar station "refused" to interact with the rocket. However, in 2018 all the technical shortcomings of the air defense system were finally eliminated. Frigate "Admiral of the Fleet of the Soviet Union Gorshkov"
“The difficulties encountered were not critical. In my opinion, they were caused by the fact that the 9M96 family and the radar station have different development enterprises. In the process of creating the “Poliment-Redut” system, a new cooperation chain emerged, which had to be “set up”. Of course, it took time, and as a result, the tests dragged on. However, the latest launches from Gorshkov, which were reported by the Defense Ministry in the fall, show that now all the elements of the complex interact with each other perfectly, ”said Kornev. Currently, "Polyment-Redut" is installed on "Admiral Gorshkov" and "Smart". The air defense system will appear on the project 22350 frigates currently under construction (Admiral Kasatonov, Admiral Golovko, Admiral of the Soviet Union Isakov), which will become part of the Navy in 2019, 2021 and 2022, respectively. Also, the new air defense complex will be equipped with the corvettes of the project 20380/20385 (the Retive, Strict, the Hero of the Russian Federation Aldar Tsydenzhapov, Sharp) laid at the Northern Shipyard and the Amur Shipbuilding Plant. fleets in 2020-2021, respectively. Kornev assumes that Polyment-Redut may receive, including naval ships, which will undergo modernization in the coming years. However, as the interlocutor of RT notes, the firing range of the carriers of the Caliber and Onyx missiles will have to be slightly modified. “The appearance of the Polymer-Redut air defense system in service will definitely enhance the combat capabilities of the Navy of our country. Russian frigates and corvettes will gain the ability to reliably defend themselves against the most modern and promising means of destruction. The new complex will allow our patrol ships to feel confident away from their native shores, ”noted Kornev. A similar point of view is held by the professor of the Academy of Military Sciences Vadim Kozyulin. In a conversation with RT, he said that the appearance of the Polymer-Redut air defense system is an adequate response to the current threats that exist for Russian ships. According to him, cruise and anti-ship missiles of western states are the greatest potential danger to domestic frigates and corvettes. “We see that NATO member countries continue to improve naval and air weapons. In addition, American ships regularly go to the Baltic and Black Seas, appear near the Syrian coast in order to "show strength." To accomplish the task of “deterring” the Russian Navy, we cannot do without high-precision strike systems and highly effective air defense systems, ”Kozyulin concluded.